While the victims of past floods are still recovering, a new monsoon is approaching Sindh. A better coordination between the government and international organisations is needed in order to avoid another humanitarian disaster. National Disaster Management Authority (NDMA) has warned of another ominous monsoon this year. According to NDMA, some 29 million would be facing flood risk in the next monsoon. This warning may sound a bit early but the track record of previous two monsoons suggests a timely wake-up call for everyone. Any critical situation cannot be ruled out. After two consecutive disastrous monsoons in preceding years, people are on tenterhooks as next monsoon is approaching. The government and humanitarian aid agencies are bracing for another possible extreme weather event. Astounding vagaries of climate, particularly during the past two years proffer ample reasons to stay alert. In 2010, the monsoon forecast suggested a moderate ten percent higher rains than normal but the baffling weather developments in Khyber Pakhutunkhwa dwarfed all estimates of precipitation. Parts of Punjab, Gilgit-Baltistan and AJK received as high as 400 and 200 percent higher than normal rains in September. Likewise, outlandish monsoon in 2011 derided all estimates when lower Sindh received record breaking rains. Parts of coastal areas received 300 mm rain within three days, twice higher than the average rainfall of the whole year in the area. Hence, the trajectory of monsoon in recent years had been dodgy. During the past two years, rain pattern manifested two key attributes of climate change; that is abnormal intensity and high degree of unpredictability. Considering these two elements a completely new approach of monsoon handling is required in the country. Limited ability of only three to four days weather forecast makes it even more desirable. A normal flood season in Pakistan ranges from June 15 to October 15 every year. It means we have just enough time to gear up. 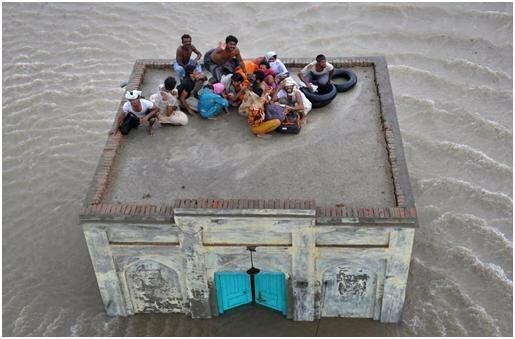 Affectees of the past two years’ floods, especially in lower Sindh, are yet to return to normal life. According to the latest update of the Office for the Coordination of Humanitarian Affairs (UNOCHA), some 10,000 people are still languishing in makeshift settlements in Sindh. The Emergency Response Fund (ERF) of UNOCHA is seeking millions to meet outstanding humanitarian targets in the country. This sufficiently indicates the plight of the flood affectees forgotten within few months. Till the beginning of this year, less than half of the amount was received against the appeal of $356 million launched by the UN. Parts of lower Sindh are still under standing water. In brief, miseries are far from over for several thousand affectees. After initial response, most of the aid initiatives are gradually fading out. International aid was simply less than enough to sustain humanitarian operations for a longer duration. Relief operation of the government of Sindh was mired in nepotism and political favouritism. Less than adequate resources were allocated for rehabilitation phase. Adding insult to the injury, the government of Sindh diverted approximately four billion rupees originally earmarked for flood affectees to elected representatives’ fund. A year preceding the next general election was the obvious time to appease party comrades. This has left thousands of people in consternation. In such a situation, even a slight climatic upheaval can play havoc with the people who are already living on the margins. Rickety infrastructure is another source of anxiety. For example, banks of left bank out fall drain that inundated large swaths of land in several districts in 2011 are largely left unplugged. Repair work has only just started and unrealistically targeted to finish by end of June . Quality of work with this execution could be everyone’s guess. In its present shape, the porous drain may not even transport normal storm flows safely, what to say about abnormal rains. The rain has become a perennial source of devastation in adjoining districts of lower Sindh. Banks of River Indus were repaired on a war-footing after the 2010 flood, however, their strength is yet to be tested. Ironically, little concentration has been paid to confounding flows of hill torrents that actually turned Indus violent in 2010 which was erstwhile amenable carrying manageable flows in South Punjab and Sindh. In absence of early warning system, these hill torrents are potentially replete with horrendous floods and need watchful monitoring. The most important element that has not received adequate attention is disarrayed institutional web when any disaster strikes. Provincial Disaster Management Authorities (PDMAs) are still bereft of sufficient resources. Trained and experienced human resource in PDMAs is a major deficiency that merits immediate attention. The most important but equally ignored part is District Disaster Management Authorities (DDMAs). Since district administration is the first entity to reach people in the event of any disaster, their inefficiency would have serious ramifications for flood prone communities. In absence of elected local bodies, DDMAs have become the sole government face at local level. These DDMAs are synonymous to the Deputy Commissioner’s office for all practical purposes. Because of their administrative priorities, they can hardly proffer any meaningful succor to disaster victims. More often than not, they swing into action only after a disaster has approached. Whereas disaster management is practically round the year job which is not restricted to administrative mania that often follows the disaster. At times good at administrative functions, DDMAs are not institutionalised as disaster management entities and lack paraphernalia to manage disasters professionally. Their strings are often pulled by local oligarchy and hence sometimes end up with compounding the impact of disaster rather than assuaging the miseries of affectees. The government has recently established Ministry of Climate that depicts sensitisation on part of the government. However, hydro-climatic disasters need more concrete measures to ensure timely warning of disasters, preparedness to forestall impacts and a well-coordinated mechanism to respond to disasters in a transparent and professional manner. Coordination among various tiers of disaster management authorities was conspicuously absent during the past two disasters. Likewise, coordination of the government with national and international humanitarian agencies was also chaotic, particularly in provinces. The best time to commence this exercise is before the onset of next monsoon. While the government is grappling with several immediate priorities, fast approaching monsoon should also find some place on the priority order before it is too late to act.